Now, when I’m looking at my laughing and throwing about toys children, I think, it would be very much to the point to write an article about TV, cartoons, clipboards and other things, which hinder our children from being happy. Though at the first glance children look namely happy, when they are being given another portion of drawn world. There a child is being entertained and occupied by animated characters. They do not abuse, claim, scream, but amuse and cause almost only pleasant emotions. 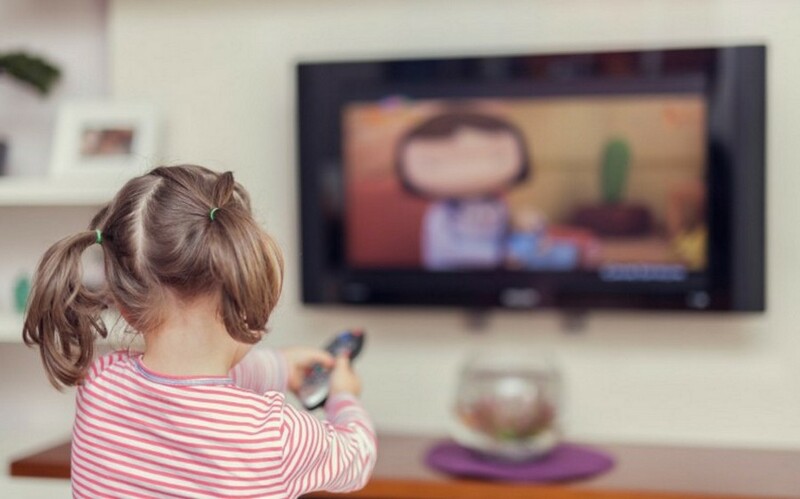 And it is very convenient for parents, when a child sits and watches TV. As if she/he is not there. He/she is already vanished in endless shots of the blue screen. And there is quiet and clean in the house. Nobody annoys with endless requests, nobody is fighting over a doll or a car, nobody asks us to draw, nobody is complaining about a brother or a sister, throwing about anything, crashing and making some odd games, where everything’s upside down. TV gives us an illusion, that peace has finally come… That one can finally engage oneself and one’s favorite things, to drink quietly tea, talk on the phone or read a book. And it often seems that there is no other way, but to address to TV-nanny. One needs to cook a dinner, finish some urgent work, make an important phone call… Other way they are going to disturb – scatter flour, trying to help, draw at a year report and annoy with questions during a phone talk. But one just needs to turn on a favorite cartoon and … silence. And you get to do more, and faster. But there are certain problems with all this blessing. And if weigh everything well enough, there are much more minuses, at that very strong, from watching films and cartoons. – The main minus is that, if a child spends his/her leisure time not with us, he/she does not attach to us. He/she is forming strong and very firm attachment to a computer or a TV. Some children even start hitting their parents, if they turn off their favorite gadget. They scream, cry, offend, since they have been taken away something valuable. Taken away something, to which he/she has been accustomed to everyday for many years. Something, with which parents have been replacing themselves. – There one does not have to think, create, do something. And a child already does not want to play with toys, create games and actions to him/herself, does not want to go outside to ride a bike or play ball, does not want to visit friends. He/she is ready to replace everything with a computer or a TV. Indeed, it is simpler. And the reality is not so interesting. – A child misses some pieces from a family life. He/she has been put to watch cartoons while mom is cooking, and he/she does not know, what she has been doing for him/her, for his/her father, for the whole family. And even how she did that. One very young friend shared, that she has never been cooking anything with her mom and has been going out from her room to eat. “I did not even think about, where cookies come from. Go out from my room, and they are there. On a plate. Only later I learned, in 20 years, how they appeared there”. This is how children miss life, which should know and learn. Miss tidying up, cooking food, lunch at the dining table, eating in front of the computer; miss all lessons, which would have prepared them to an independent life. Yes, perhaps, he/she is better, more pleasant to be close to a computer or a TV. But is it not a signal, that we are doing something wrong, miss something in relationships? What could be more expensive, than this created life with made up emotions and feelings? Only real relationships. If a child has them, he/she will make right choices, if there are none, he/she will choose one-on-one with a computer. And no restrictions and permissions won’t help to drag him/her from it. If parents give practically only negative emotions by their grumbling and constant displeasure, then, of course, the choice won’t be on their side. Try to make one week without computer and TV as an experiment and you will see, how interesting can the life of a child be. You will notice that he/she laughs more often, goes more often for a walk, spends time with friends, books and… with You. “Mom, I am bored, give me your cell phone!” How do children become dependent to gadgets?